Recently highlighted in InsuranceNewsNet Magazine, the funeral trust market is currently experiencing huge demand. Agents across the nation are helping clients with no long-term care insurance plan for funeral costs with a Medicaid-exempt product. Fill out the form below to get instant access to the video! 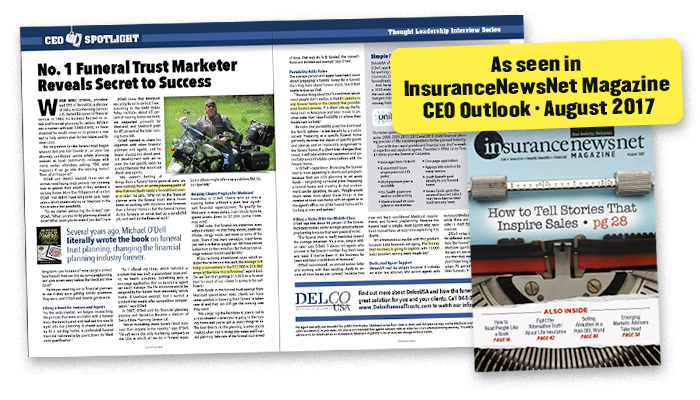 Receive more innovative industry offers | Manage my InsuranceMail Subscription | Advertising Information | InsuranceNewsNet © 2017, All rights reserved.